Named for the trees that once grew along the Paw Paw River, Paw Paw is a rural village in the southwest corner of Michigan, located in Van Buren County. Proximity to Lake Michigan gives the area moderate temperatures and a climate good for growing grapes. The Great Lakes region is also historically known for vast oil reserves. Between 1980 and 2007, Michigan experienced an 85% drop in oil and natural gas production, creating a fragile job market in Paw Paw. To compensate for the energy job losses, the region worked on developing cost-competitive renewable energies industries, but consumer investment in fuel alternatives has been weak. Michigan’s grape industry has also seen its share of struggles in recent years, as higher water prices and raw material costs, combined with cold weather damage to crops, have significantly lessened local grape yields. As of January 2016, Paw Paw is the 30th poorest community in Michigan with an estimated poverty level of 43.8%. 30.3% of individuals over the age of 25 did not earn a high school diploma. 32.4% of individuals over the age of 16 are unemployed. 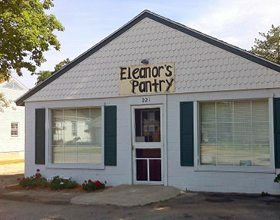 Family-to-Family’s partner organization in Paw Paw is Eleanor’s Pantry, established when four church pantries were consolidated into one central pantry. Now run by more than 70 volunteers, Eleanor’s Pantry provides food to over 1,000 children and adults every month from Paw Paw and the nearby town of Lawton. The effects of the slow economy on this community are clearly reflected by the increased number of visitors to the pantry, which served around 650 visitors a month in 2009 and an estimated 11,000+ in 2012. In Paw Paw, Family-to-Family partners with the Feeding America West Michigan Food Bank to provide groceries for our sponsored families. Yes, I’d like to sponsor a family! Family-to-Family, Inc. (EIN # 57-1169066) is a non-profit ogranization exempt under the 501(c)(3) section of the Internal Revenue code. Family-to-Family, Inc. (EIN # 57-1169066) is a non-profit organization exempt under the 501(c)(3) section of the Internal Revenue code.